I am using webroot for 5+ years, Very disappointed right now. Support did send me an email some weeks ago to say that someone would contact me to help sort this out. So far this has not happened and it is now over a month since the problem occured. I cannot wait any longer so am going to have to re-create my passwords from scratch manually. Not happy! I have tried contacting Webroot Support for this issue but so far have not heard anything. Sent message on 1st October. How long before we should be contacted to at least acknowledge something is being done? I called Webroot support yesterday and was told there were currently 138 other open tickets with similar issues accessing the password manager. Good to know Webroot is working so 'diligently' to resolve this issue. It just boggles the mind that a company with such a good AV product cannot create a password program that actually works as advertised. If they cannot or will not suport it then they should stop marketing it and leave password programs to companies who actually know what they are doing. Regardless if I get my passowrds back or not Ill never purchase another Webroot product. I finally got my Mobile device straightened out and I can now log into the Vault with my Passwords. All I did was use the "Forgot Password" and everything is working as it is suppose to with WSAC. I changed my keycode on my Mobile device from Beta to my 5 year license and I'm getting an error when signing into Password Manager. It could be my gmail account isn't working or it could be the keycode. I'm having issues with my consoles. I can still obtain PWM from my PC devices. Yep; me too Sherry. Once the Technician fixed the boo-boo ( Halloween Plug ) with my Keycode, I was able to see/change/delete/ some passwords that I no longer use. I feel for the loyal and long time volunteers like yourself; who have to put up with the lazy non committal stuffed shirts in the main office that use all of you folks like cannon fodder. Thanks to all of you LOYAL VOLUNTEERS who take the brunt of the rudeness dished out by those who are supposed to be in charge of Webroot. My hats off to all of you. I am fortunate that I can still sign in to the PWM from the Online Account Console without any issues. That's good, Sherry. I cannot see passwords in my console but my PWM is still working in Firefox (rolled back to 61.0.2). I get the same thinng as Daniel, only with an added error message (FF 61.0.2). I really feel sorry for the people that ONLY use Webroot's PWM without any backup PWM. Thank God I have also LastPass (Free) and RoboForm also. No response from the Employees on how the fix is going and the above member with 2 Support tickets without a response from support. I've been with Webroot since the launch of WSA and this Forum. This is about the sorriest event I have ever seen for Webroot non-communicating (Updating progress on fix) with the members. We are only Volunteers here on the forum, it's out of our hands and in the hands of the Webroot Employees. WEBROOT: THE BALL IS IN YOUR COURT! My subscription is good thru Feb 2019, How many tickets do I need to open until I actually get support? Hi Sherri, I was having a heck of a time accessing my saved passwords. For some unknown reason I kept getting a message that my Keycode had expired when in fact I knew that I had many Months left. For the life of me, I couldn't log on to view my saved passwords and even though I knew my Password to the console, the problem with the " expired Keycode " stopped me cold. I contacted Webroot via a phone call and they were able to "fix" it so I could at least see my Passwords and log on to various Websites.They confirmed that my Keycode was valid. Password Manager is still not working but at least I can get to all my saved Passwords. Thank you for reminding me.. I am sorry, I did remember you saying that you had key code issues prior. 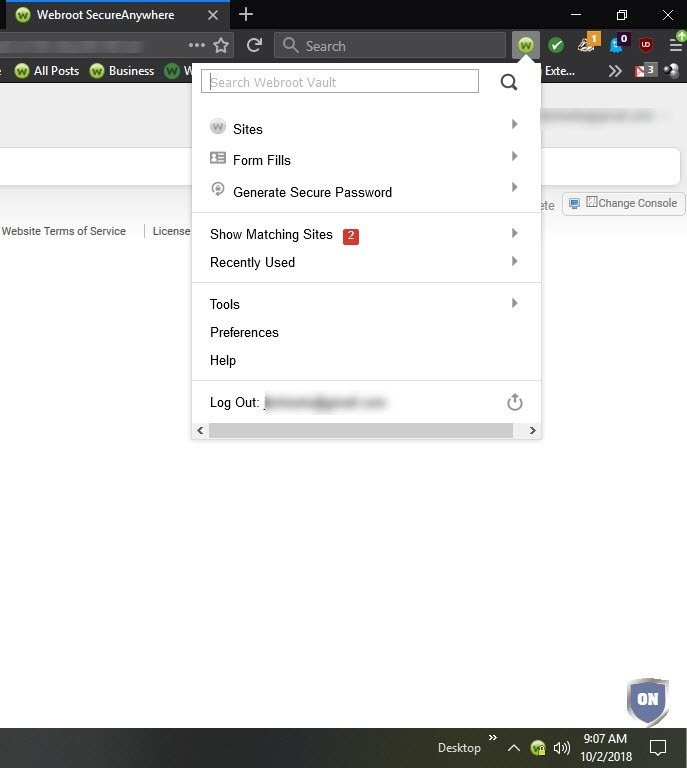 I have been able to access my Online Account Console to get to my Password Management. But I got ahead of myself thinking that Webroot Support miraculously had a fix for PWM in Firefox.as they sometimes do. I'm happy to hear you have Webroot running with your key code now. It's odd how that Webroot Keycode gets disrupted like that. Cloud issues I guess..
Ok, So i called Webroot and was told this is known issue where users are unable to login to password manager and they are working in but not sure when this will be resolved( I really need access to psw file ) Also i am missing "Passwords" tab from web console. Greetings echad, I was in the same boat you are in and here is what I did. First off I dont know where you are located but Webroot is located in Colorado and I am in California. There is a one hour difference between us. I called them at 866-612-4227 just a few minutes after they opened. A few moments later I was talking to a technician and he was able to help. I did not hear back from customer support team. I need access to my psw file this is important and related to my job. I already submitted the ticket, Hopefully i hear back soon. Hello echad, Welcome to the Webroot Community Forum. Please submit a Support Ticket or Contact Webroot Support. This service is FREE with a Paid Subscription.